After having taken a cursory view of Luxor and Karnak, to which my curiosity led me on my landing, I crossed the Nile to the west, and proceeding straight to the Memnonium, I had to pass before the two colossal figures in the plain. I need not say, that I was struck with wonder. They are mutilated indeed, but their enormous size strikes the mind with admiration. The next object that met my view was the Memnonium. It stands elevated above the plain, which is annually inundated by the Nile. The water reaches quite to the propylon; and, though this is considerably lower than the temple, I beg leave to observe, that it may be considered as one of the proofs, that the bed of the Nile has risen considerably higher since the Memnonium was erected; for it is not to be supposed that the Egyptians built the propylon, which is the entrance to the temple, so low as not to be able to enter it when the water was at its height. There are other proofs of this opinion, which I shall have an opportunity of introducing in this volume. The groups of columns of that temple, and the views of the numerous tombs excavated in the high rock behind it, present a strange appearance to the eye. On my approaching these ruins, I was surprised at the sight of the great colossus of Memnon, or Sesostris, or Osymandias, or Phamenoph, or perhaps some other king of Egypt; for such are the various opinions of its origin, and so many names have been given to it, that at last it has no name at all. I can but say, that it must have been one of the most venerated statues of the Egyptians; for it would have required more labour to convey such a mass of granite from Assouan to Thebes, than to transport the obelisk, commonly known under the appellation of Pompey’s Pillar, to Alexandria. As I entered these ruins, my first thought was to examine the colossal bust I had to take away. I found it near the remains of its body and chair, with its face upwards, and apparently smiling on me, at the thought of being taken to England. I must say, that my expectations were exceeded by its beauty, but not by its size. I observed, that it must have been absolutely the same statue as is mentioned by Norden, lying in his time with its face downwards, which must have been the cause of its preservation. I will not venture to assert who separated the bust from the rest of the body by an explosion, or by whom the bust has been turned face upwards. The place where it lay was nearly in a line with the side of the main gateway into the temple; and, as there is another colossal head near it, there may have been one on each side of the doorway, as they are to be seen at Luxor and Karnak. All the implements brought from Cairo to the Memnonium consisted of fourteen poles, eight of which were employed in making a sort of car to lay the bust on, four ropes of palm leaves, and four rollers, without tackle of any sort. I selected a place in the porticoes; and, as our boat was too far off to go to sleep in it every night, I had all our things brought on shore, and made a dwelling house of the Memnonium. A small hut was formed of stones, and we were handsomely lodged. Mrs. Belzoni had by this time accustomed herself to travel, and was equally indifferent with myself about accommodations. By some extraordinary catastrophe this statue has been thrown down, and the Arabs have scooped their millstones out of his face; but you can see what he was, the largest statue in the world. Far and wide his enormous head must have seen, eyes, nose and ears. Far and wide you must have seen his hands resting on his elephantine knees. You sit on his breast and look at the Ostride statues which support the porticos of the temple, and they seem pigmies before him. Nothing that now exists in the world can give any notion of what the effect must have been when he was erect . 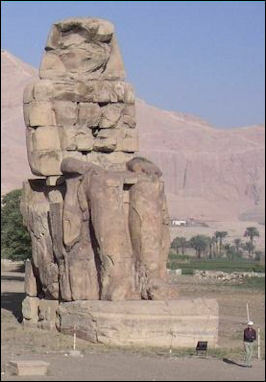 . . Rameses was resting in awful majesty after the conquest of the whole known world. From the temples of the plain, the traveler moves on into Biban al-Muluk the Valley of the Kings.